Former Autodesk Instructables AIR Craig Dorety uses mathematics and engineering to formulate physical space-time distortions. 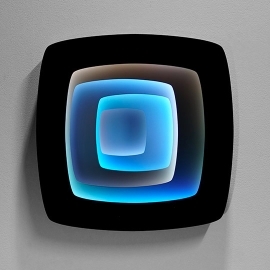 He creates his works using industrially prefabricated LED technology and custom firmware. Clean lines, simple shapes, self-similarity on varying scales, and pure, changing color are his palette; information systems and data-sets are his subject matter. Craig has a BS in Mechanical Engineering from UC Davis. He has had work exhibited at Yerba Buena Center for the Arts, Jellyfish Gallery, SoMA Arts, Dogpatch, and FnF Festival, and has received awards from The California Foundation of the Advancement of the Electronic Arts, The Awesome Foundation, and MakerFaire. He is represented by Johansson Projects in Oakland.